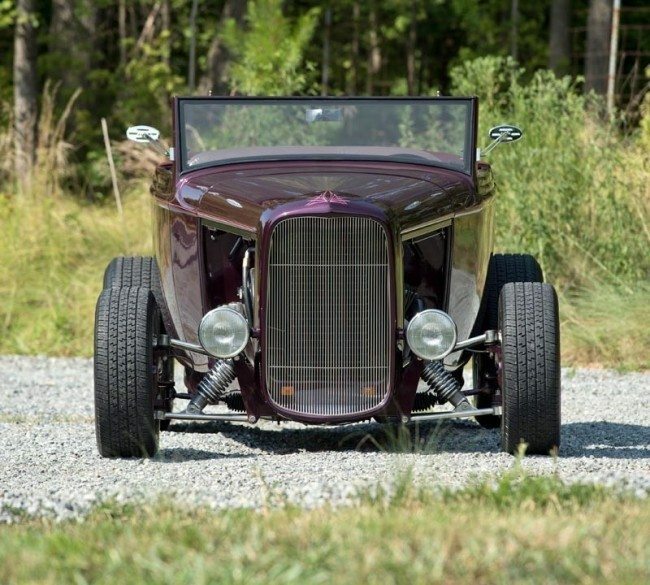 When you set your sights on creating a top-notch roadster, you have to start with a great design, and what’s where this beautiful ’32 gets it just right. Henry Ford himself would be proud of this fine custom. Then, you need a team of professionals who know the ins and outs of fabrication and assembly. With the right vision and a blend of the best components, you can have that vintage look with plenty of modern amenities. 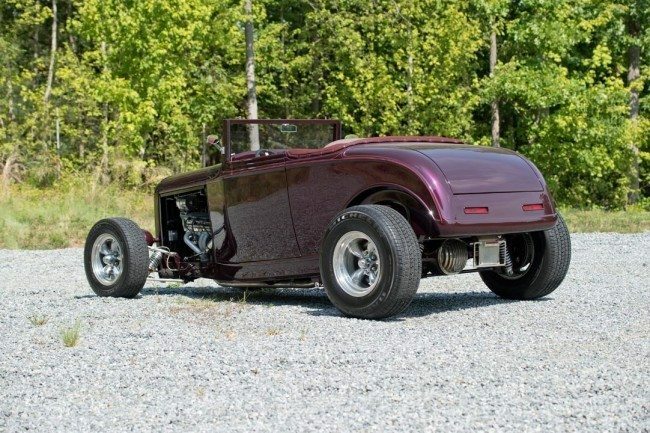 This sweet Ford Hi-Boy executes that well, and with its custom suspension, reliable V8 and classic color combination, is a ground-up build that combines the core strengths of old-school hot rodding with top-notch modern componentry. This project began with a full fiberglass body and a custom chassis. During a thorough build, fresh resin was carefully sanded and layered in deep purple 2-stage. They detailed it with red pinstripes, complemented with smoked glass and a traditional billet grille, all backed up by H4 Headlamps for modern safety. The matching cloth top is brand new and ready if you need it. By now it’s probably pretty obvious this Ford was built to be seen. But, thanks to the nicely built 350 cubic inch Chevy beneath the car’s steel hood, that might be easier said than done! The big polished mill revs under a big 4-barrel carburetor, which rides between a polished scoop and an aluminum intake. Polished aluminum heads and valve covers are set off by a modern Mallory distributor and black Taylor cables. Coated block hugger headers take care of the spent gases, while polished pulleys spin a polished alternator opposite a custom AC compressor. The tri-core radiator circulates clean coolant past a large, electric puller fan, and the hot small block looks right at home in this Ford’s glossy engine compartment. 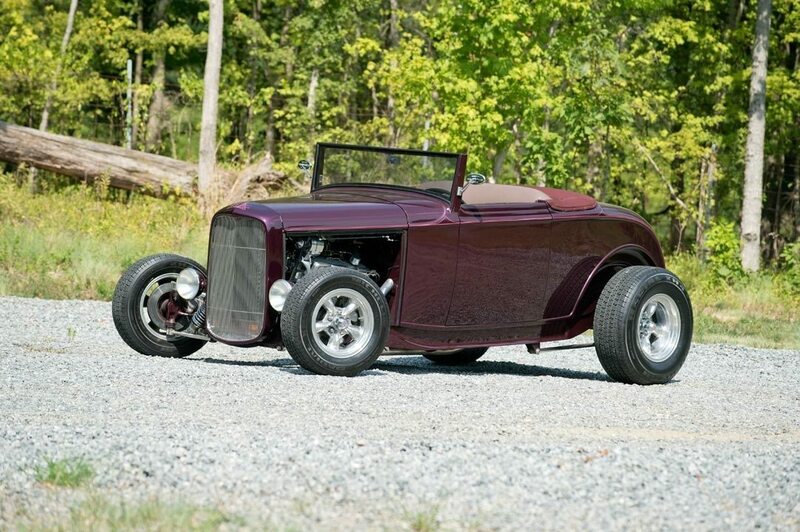 This fine roadster features a proven custom suspension with an independent front half and 4-link rear half to produce new age ride and handling characteristics. At the center of that suspension, a proven Turbo-Hydramatic 350 3-speed sends power to a tough Ford 9-inch that’s fitted with road-ready gears. Quick stops are provided by power brakes with stainless lines and braided hoses connecting the modern front discs and traditional rear drums. Full rack-and-pinion steering makes handling a breeze, and the killer soundtrack to your road trips is provided by a large-diameter, true-dual exhaust system, which employs old school, glasspack-style mufflers. At the corners of the car, polished American Racing Torq Thrust IIs spin 195/70R14 Michelin Radial XH4s in front of 255/70R15 Michelin Radial XH4s at the rear. 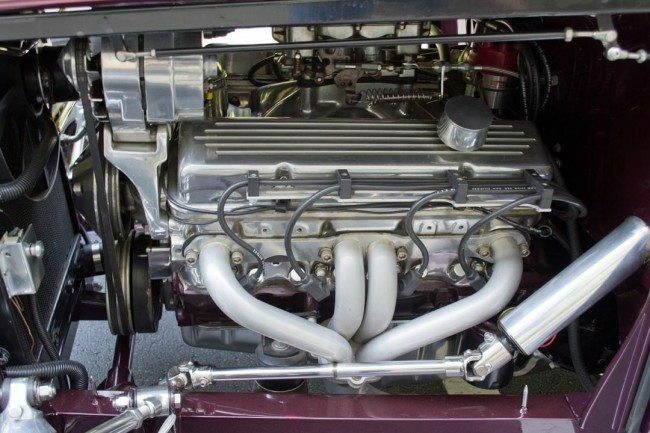 Take a look underneath, because the bottom of this Ford features fine details such as glossy purple floors, a polished flywheel cover, and finned and polished fluid pans. 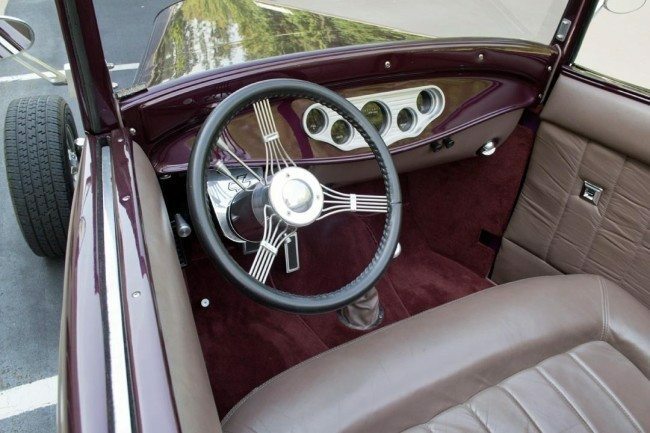 Inside this clean roadster you’ll find a subdued tan leather interior that provides stylish contrast to the purple body panels, and done up in a traditional bench seat motif. At the sides of that seat, the custom door panels are equipped with power window switches. Below those panels, like-new carpet frames a familiar Lokar shifter. At the front of the car, a body-matched dash places the digital telemetry perfectly above billet foot pedals. Behind the driver, a completely upholstered trunk hides a small fuel filler. You’ll stay connected to the road through a banjo-style steering wheel, which rides on a polished, tilting column. If the convenience and comfort of a modern car, wrapped in an old-school package sounds like fun, it is. Undeniably cool, it features an unbeatable combination of classic good looks and modern hot rod technology wrapped in a professional build. If you have a custom or another collectible you’d like to insure with us, let us show you how we are more than just another collector vehicle insurance company. We want to protect your passion! Click below for an online quote, or give us a call at 800.678.5173.